Marijuana legalization continues to be a debate in all states. Many have considered its benefits while others remained in close contempt to put away any facts that one can get from using marijuana. It’s a worldwide issue which resulted to countless amounts of studies to gather information whether or not cannabis is helpful. According to series of results, anyone can benefit from this plant especially those that needs medical attention that can’t be found alone from regular medication. How is this possible? Cannabis alone contains a lot of neuron elements that has a great affect to the body. Colorado is one of the few that actually passed the legalization of marijuana and surprisingly, it helped with their economy. Many individuals are now open to opening up their own canna-business and a lot are undergoing herbal treatments using this weed. So why can’t us? 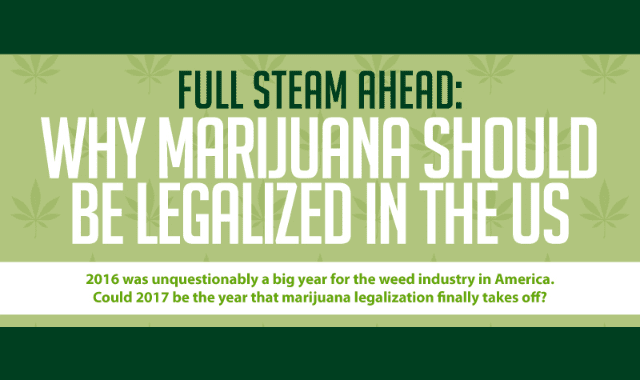 This infographic offers a broad and detailed marijuana facts, benefits, and statistics on its positive effects to users. Not only that but it also shows the economic boost it gave to states which have legalized the said substance. It also provides a comprehensive information about its medical benefits to those who need a cure for their illnesses.